It’s a new open water fishing season across the Midwest. Most of the states that have a closed season for some species of fish have opened, and in places where the season never closes, anglers have been fishing and catching for several weeks. It used to be that anglers planned their fishing trips well in advance of the trip itself, and many still do. They enjoy the expectations of the upcoming trip and all the planning that goes into the trip. However, more and more, anglers are taking spur-of-the-moment fishing trips and trips in general. This new way of doing things come directly from conversations with resort owners and tourism people. People sometimes unexpectedly get some extra time that they didn’t expect to get. They find out on Tuesday that Saturday and Sunday are going to be open, so they decide to go fishing. That’s wonderful. If you’re that type of person, following are some ideas for taking full advantage of that unexpected fishing trip. First of all, my fishing equipment is usually ready to go. I keep all my gear in the back of the truck or in the boat once fishing season rolls around. I always have several rods that are spooled with good line, the trolling motor batteries are always charged: I’m pretty much ready to go fishing whenever I get the chance. Now it’s time to find a place to go. You can call friends for ideas, maybe you have connections near some potential destinations. Check out fishing reports on the Internet. Some of those reports are reliable, some aren’t. Of course things can change by the time you get to our destination, but up-to-the minute reports can be very helpful when trying to decide where to go fishing in the next few days. I try to go to bodies of water that have progressive regulations whenever possible. The fishing, for the most part, on these lakes and rivers is just better. Not always, but often. Lakes like Winnie and Kabetogama in Minnesota, Clear Lake in Iowa, and Green Bay in Wisconsin are outstanding examples of lakes that can provide outstanding fishing much of the year. There are many, many other bodies of water that can do the same. In many areas of the country largemouth bass, smallmouth bass, and muskies have seen tremendous results from progressive limits. Areas that have reduced the panfish limits have also seen great improvement in panfish quantity and quality. If you’re planning a spontaneous fishing trip, it would be a good idea to look first at areas that are effectively managing their fisheries. Now you just need someone to go with you on your spur-of-the- moment fishing trip. It’s almost always more fun to fish with someone. A family member might be able to come along, or maybe a friend can get away. You can share costs and companionship. That’s always a good thing. The key is, when you get the opportunity to go fishing, you need to take advantage of it. And, if you don’t get the opportunity to go, make the opportunity. 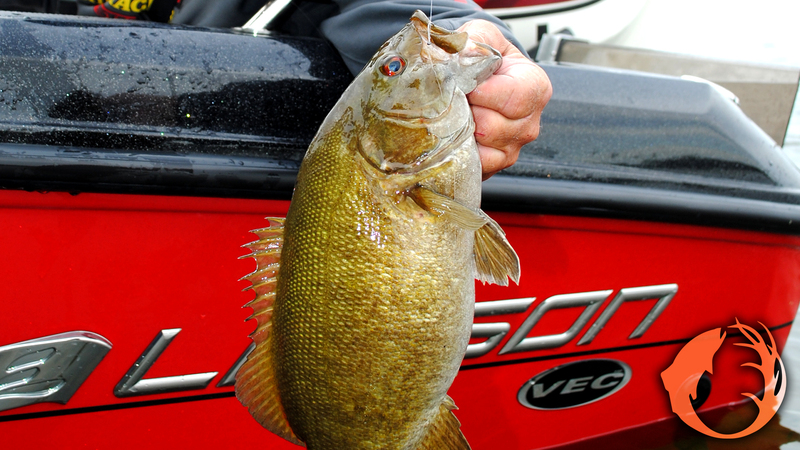 Photo: On a spur-of-the-moment trip last season, the author and Mike Frisch found some outstanding smallmouth bass fishing in central Minnesota.